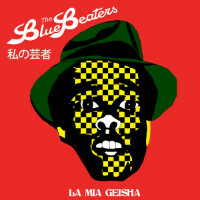 The Bluebeaters squeeze in another single off their superb Everyone Knows album before the end of the year with their take on Luigi Tenco’s 1962 Italian hit and croony ballad, La Mia Geisha. Poor old Luigi sadly committed suicide in 1967 after hearing that another of his songs had been eliminated from the Sanremo Music Festival a.k.a. the festival which inspired Eurovision. If only he’d heard this cheerfully upbeat rocksteady version before picking up that pistol, things might have been different.